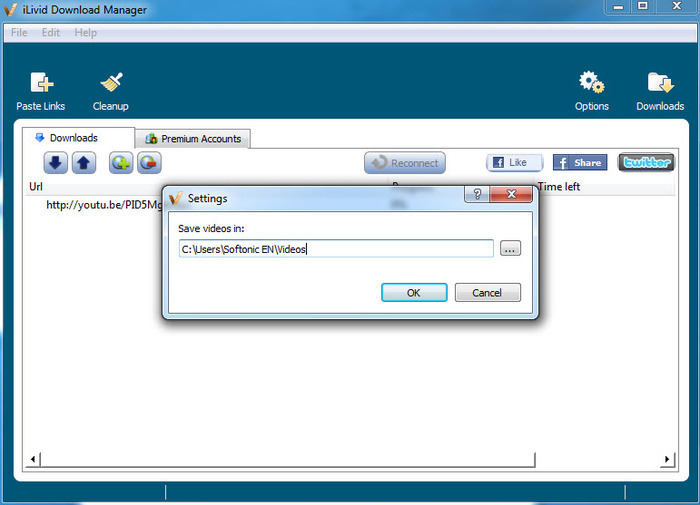 iLivid (iLivid download manager) is developed by iLivid.COM group whose support email is [email protected], a leading creator of Internet Live Video player software, located in Israel. Such product is an ad-supported program applicable to all Windows OS (operating system) that helps enhance, with a size of only 1.2 MB, the experience on viewing videos of all common format formats and enables PC users to watch any video file (including zip compressed files, rar compressed files, multi part compressed files and password protected files) hosted on remote hosting service over the internet. It boasts the capability to check the availability of a link without bothering PC users to check themselves; the fast speed to stream or download a video; the compatibility to many more formats and the free service. iLivid has thus gained great popularity, leading to the extending of its own products like iLivid.com search engine for promotion and iLivid toolbar which claims to save the work of manual search, mark and copying video links in the page one by one as well as increasing third-party programs encompassing searchqu toolbar bundling with it. The more third-party programs bundling with it, the more profit it gains, which is the commonly adopted way for freeware like iLivid to keep alive in the market. For this reason, extra attention should be paid during the installation. “Recommended” installation manner always gives rise to additional installations which is undesired, while “custom” installation manner doesn’t. Taking the fact that extra applications can be mounted onto a computer through “recommended” installation manner into consideration, CPU will be consumed more and thus sluggishness will be caught should such manner be ever adopted. If those are too overwhelming to be tackled down, VilmaTech Online Support is always ready to give a hand. Being arbitrarily transferred to iLivid.com than the intended web page. Being faced up with constant pop-ups in the corner of the screen recommending other sites to visit. Being suffered from unmanageable slow computer performance. Being plagued by dramatically reduced online experience. Being forced to install iLivid toolbar. Some people even consider iLivid as a malware based on the fact that no indication of iLivid is shown in the list of programs that can be removed from Control Panel even its icon appears on the desktop; that its folder where it resides is hidden and that “uninstall iLivid” file doesn’t work. What further reinforces the idea that iLivid is a malware is Webroot detects it as a “threat”. VilmaTech Research Lab, based on the test taken on virtual machine, found that registry entries in database were modified by iLivid under various directories. Since such product introduces in many browser applications to arbitrarily replace default ones, associated configurations are modified there therewith. Random change of registry entries should arouse attention, especially those by web applications as the network becomes the major port through which infections worm their way. That’s why lp.ilivid.com pop up, search.conduit.com redirect virus had been detected after the installation of iLivid. Obviously, it is not completely safe to download and install iLivid. The eagerness of finishing an entire storyline can be fulfilled by alternative options like IDMan (Internet Download Manager). Remove iLivid is always recommended should there be any computer/browser problems made by it. The following steps will guide to remove iLivid as well as its affiliates like iLivid.com and iLivid toolbar. Be noted that computer knowledge is always called for when going through the steps below. Tangled computer issues will be blame for deviations. Should there be any shortage of technology, professionals from VilmaTech Online Support are ready to offer expert help with solutions exclusively applicable to concrete situation aiming at a complete and through removal. Due to the different configurations on PCs, iLivid can be found and removed from Control Panel on some PCs. Click on “Unpin” button on the bottom-left Start Screen. Choose ‘Control Panel’ in the pop-up sidebar. Enter into “Programs and Features” to remove iLivid. 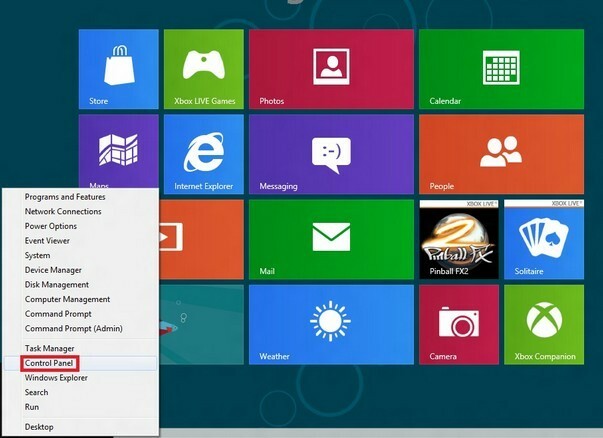 Choose ‘Control Panel’ from Start Menu. 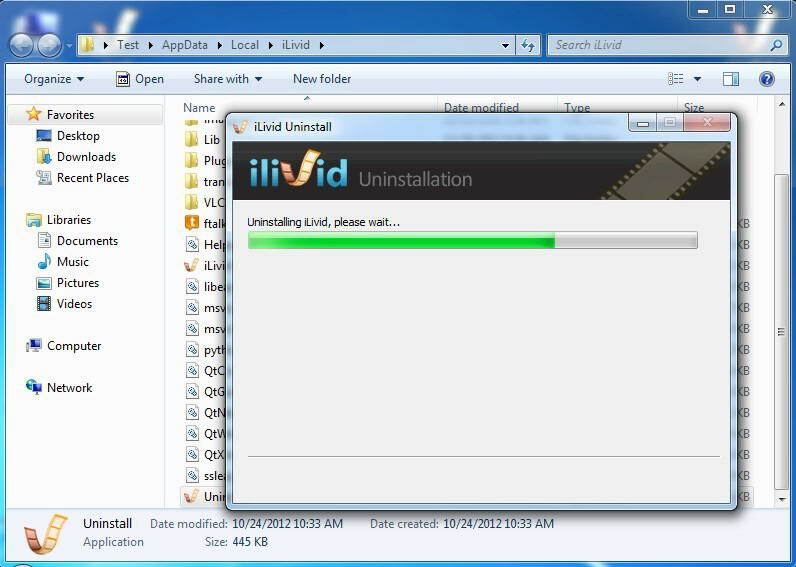 Select “Uninstall a Program”/ “Add/Remove Programs” to remove iLivid. Remove iLivid with its own widget. Right click on iLivid icon on the desktop to get a drop-down list. Select ‘Properties’ and choose ‘Open File Location’ under the ‘Shortcut’ tab. Tick ‘Remove’ and hit ‘Next’. Choose ‘Yes’ to allow iLivid uninstall itself automatically. Remove iLivid by modifying and deleting its registry entries in database as well as deleting hidden items in C disk. Step one: remove iLivid’s registry entry from database. Hover mouse over any border of the Start screen to enable Search charm. Type ‘regedit’/‘regedit.exe’ and hit Enter key. Press and hold Ctrl and F key together to bring up ‘find’ box. Copy and paste the below key into the box to hit Find button for the removal. Hold Win key and R key together to bring up the Run box. Type ‘regedit’ and hit Enter key. Hold Ctrl and F key together to bring up ‘find’ box. Step two: remove hidden files after showing them with build-in functionality. Open any folder on the Start Screen. Click on View tab to tick ‘File name extensions’ and ‘Hidden items’ options. Press on “OK” button for the confirmation. Back to the Start screen to navigate to C disk. Find and delete any item named after “iLivid”. Get into ‘Control Panel’ from Start menu. 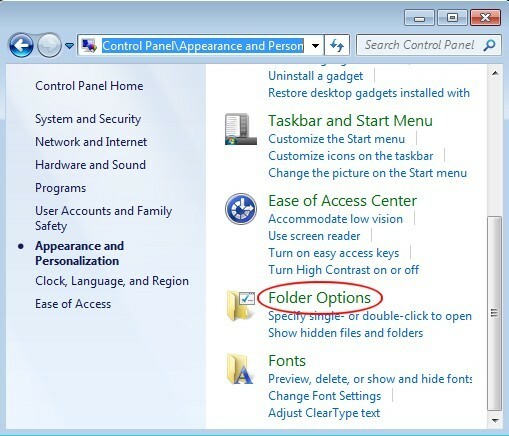 Click View tab to tick ‘Show hidden files and folders and non-tick Hide protected operating system files (Recommended)’. Press ‘OK’ for the confirmation. After removing iLivid, please proceed the below steps to remove iLivid.com redirect virus and other affiliates. Exterminate running process of iLivid.com so as to make the subsequent rectifications smoothly. But to guarantee that no error message popup when directly removing iLivid.com, please complete the modification before ending process. Enable Search Charm bar again to type ‘Task’ and hit Enter key. Hit View tab to select ‘Show Kernel Times’/ ‘Select Process Page Columns’. Tick PID (Process Identifier) and press OK.
Search ‘LSASS.exe’ for its image of the User Account which does not belong to system. Back to the Start screen and press Win key and R together. Enter in ‘CMD’ in the pop-up box and press Enter key. 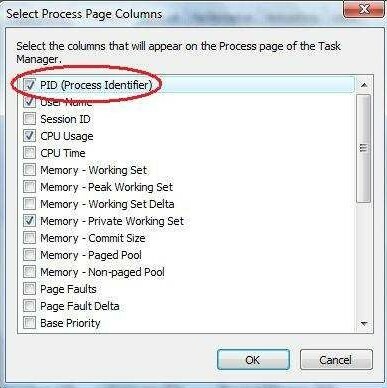 Type ‘ntsd –c q -p (PID, the number you saw on Task Manager)’ (without quotation marks) the press Enter key for confirmation. 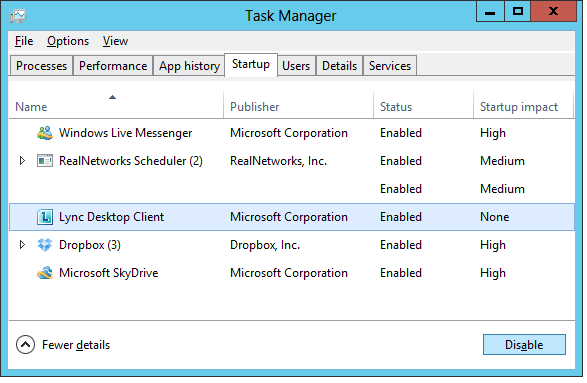 Back to Task Manager again to select Process tab. Search and select running process of iLivid.com. Hold Ctrl, Alt and Delete key combination together. Should there be any confusion with the instruction or one be stuck at some point, live chat with VilmaTech Online Support for instant help. Remove startup item of iLivid.com redirect virus to stop its autorun. The modification is also to be made in Task Manger. Hit Startup tab to search and select startup items of iLivid.com and click ‘Disable’. Hold Win key and R key together to bring up ‘Run’box. Type ‘MSCONFIG’ and hit Enter key. Check startup items of iLivid.com and click ‘Disable all’. Remove any indication of iLivid.com redirect virus from browser configurations manually to remove iLivid.com redirect virus directly. Go to Tools option and select Internet option at the bottom of the drop down list. 1) Empty out browse history. 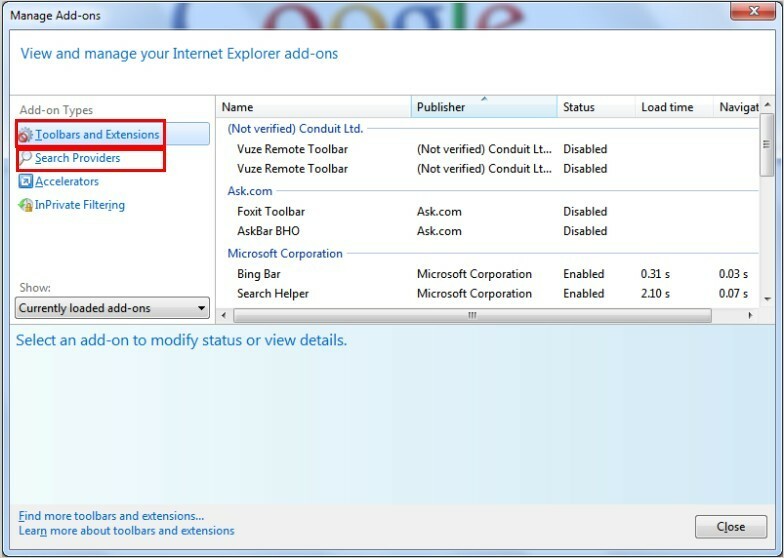 2) Select ‘Search’ section to enter into ‘Manage Add-on’ window, remove iLivid.com there. 4) Retrieve your default homepage back from iLivid.com in ‘Search Providers’ section. Turn on ‘Popup Blocker’ if there’s any irritating ads occur. 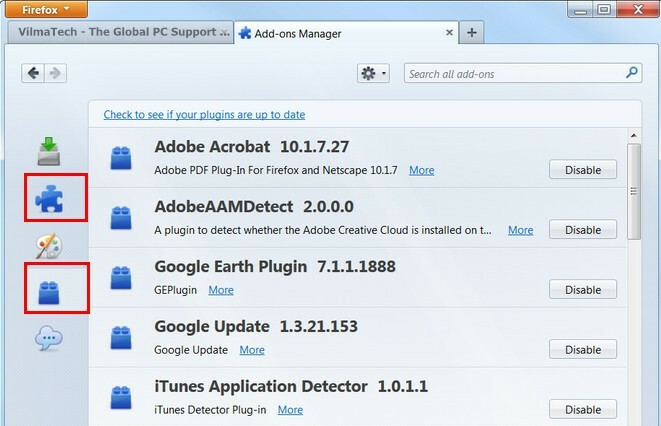 Click on Tools menu to firstly remove iLivid.com redirect virus from “Manage Add-ons” section. Remove iLivid.com redirect virus together with its toolbar from Extensions tab. To guarantee that iLivid.com and other related web apps are gone for good, one should also check the terms under Plugins tab and remove any indication from there. Click on ‘Customize and control’ Google Chrome icon and go straight to ‘Settings’ section. Locate “Search” section on the right pane and select “Manage search engines” to retrieve favorite homepage. Then go to remove iLivid.com redirect virus together with its toolbar from ‘Extension’. Remove all suspicious files under C: Windows and System32 to thoroughly remove iLivid.com redirect virus. Delete all executable files identical to systematic ones, such as svchost.exe and winlogon.exe in sub-directories under C: Windows. Remove temp folders under System32 in C disk. Remove iLivid.com redirect virus as well as its toolbar from database. to find and select items of iLivid.com and then right click on selected item to delete it. to find and select items related to iLivid.com and then right click on selected item to delete it. According to a long-term survey, Mac has been found to get iLivid.com redirect virus. But the steps to remove iLivid.com from Safari can be easy. Reset button will do the trick. 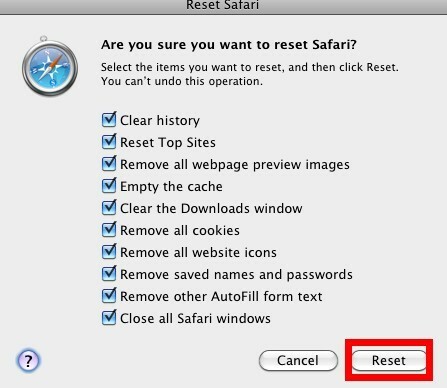 Go to Safari menu and choose ‘Reset Safari’. Tick all given options on the pop-up window and press ‘Reset’ to confirm the change. Due to the proper modifications to registry entries, most anti-virus programs can’t detect iLivid, let alone remove it. Manual method is so far the most efficient way to stop iLivid from introducing more unwanted applications onto a computer. As there are so many third-party programs mounted onto one single computer along with iLivid, more steps may be put into the removal. To gain back perfect browsing experience, removing iLivid should be placed in the first place. Otherwise, web issue incurred by iLivid will definitely survive from the above steps. Another thing needs to be noted that any other junks/ infections also need to be removed from the places where the above instruction requires so that no rogue/vicious items would help remain unpleasant issues. Be careful when following the steps. 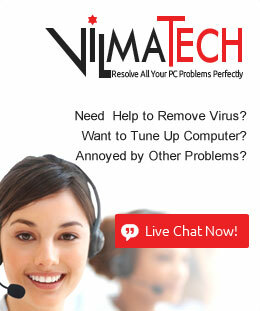 Should unexpected problems pop up from nowhere, experts from VilmaTech Online Support are ready to rescue the situation.